This album sums up where Bright Eyes is at in his career right now - signs of emerging talent, excellent guile and songwriting ability, but sadly overreaching his limitations and believing in his own ego. The CLUAS Verdict? 6 out of 10. Conor Oberst aka Bright Eyes has built up quite a cult following for himself over the years with some grand EPs, but he has never drifted into mainstream attention. This is due to his own discontent with large companies who milk the moderate success of every aspiring act with their total control over radio stations and venue bookings. Oberst is prepared to fight against the commercialised beast though and this album is his latest effort. Despite his claims that companies like Clear Channel are exploiting the music scene, the songwriter released this album on the same day as his electronica experiment entitled 'Digital Ash In A Digital Urn'. There's nothing wrong with that as many fans eagerly snapped up both albums. Although a problem does arise when there is a feeling of unfullfilment branded into one of the albums. 'I'm Wide Awake, It's Morning' starts well but the excitement soon fades off before the LP even reaches its climax. The album opens with Bright Eyes telling a very uninteresting story about a woman experiencing a plane crash, which is a complete waste of one minute and forty seconds. In saying that, he then rips into the bittersweet 'At The Bottom Of Everything' which could have used that wasted time for another verse. Every second is then used to perfection on the following track 'We Are Nowhere And It's Now', where Emmylou Harris lends her gracious backing vocals to a stirring gem of a tune. After two stripped down numbers, Bright Eyes doesn't lift the mood but instead continues on the same flat note with more sterile, two-minutes-too-long songs. By the time he launches into the delicately cut 'First Day Of My Life', your finger might already be placed on the skip button. An injection of country-tinged nostalgia arrives in the form of 'Another Travellin' Song' and Emmylou Harris again appears on the achingly sweet 'Land Locked Blues', which showcase the talent that he does have. But your patience will be tested time and time again and you find yourself searching for a Ryan Adams CD instead. 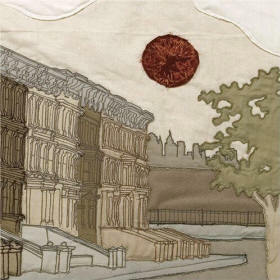 The confessional lyrics, the mellow atmosphere that surrounds the melancholic vocals and the shimmering array of instruments (which include guitars, drums, trumpet, piano, mandolin, organ) are all trademark stamps of Bright Eyes' music. While artists are normally encouraged to stick with what they know best, sometimes it is a welcome surprise when they drift slightly off track and deliver music of impeccable originality. Sadly there is little to get overly excited about on this album. To buy a copy of this album on Amazon just click here.